My 2019 Art Calendar is ready to take its place on the bookcase in our entryway hall. That way, it is the last thing that I see when I leave home and the first thing that welcomes me back. My 2018 Art Calendar has been a trusty companion these past 365 days, so it is only fitting that I finish with the last painting of 2018. Actress on Stage (aka La Petite Langue de Colombine) came into being in 1915 by the Russian artist, Konstantin Andreyevich Somov. It is a watercolour, gouache on cardboard. You may be wondering – as I was – what is gouache? In my search, I found that gouache is a type of water-media that has a history dating back over 600 years. It is a paint consisting of natural pigment, water, and a binding agent such as dextrin. Like watercolour, it can re-wetted but has been modified to be opaque, which is brilliantly displayed in this vibrant scene full of festivities. The fireworks against a sapphire blue background, harlequin colours and fancy mask reminiscent of Venice’s carnival invite us to enter the celebrations. The young woman is moving forward with a smile and eyes fixed on us, her arm outstretched to balance herself. Behind her are other revellers and beside her a lamp to light the path surrounded by flowers. It is a perfect ending to 2018. 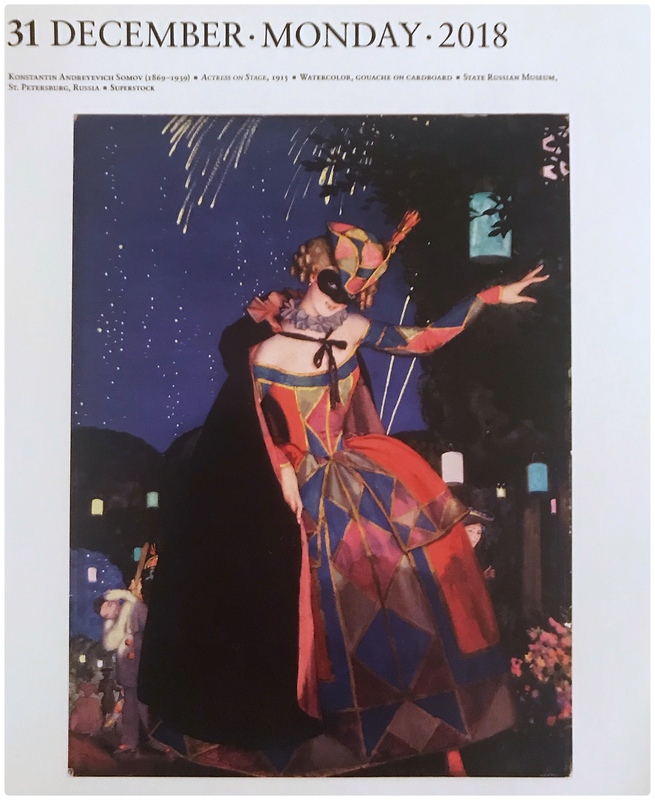 Konstatin Somov was one of the artists who, in 1899, founded Mir iskusstva (World of Art), a Russian magazine that would inspire and influence an artistic movement within Russia. One painting leads to many stories and avenues of exploration. Welcome to 2019! We are on a grand adventure. What a gorgeous painting! I love the Masquerade Gown! Perhaps I should get an art calendar. I’m always with the cat calendars. They are sooooo cute! Oh, I have seen those marvelous cat calendars. So next year, you check out the art calendars and I’ll check out the cat calendars. Here’s a thought – there may be a 2019 cat calendar left at Chapters!! I just found one on Amazon.ca. The joys of on-line shopping. A vibrant painting to end the year. Your art calendar is a treasure. I am so glad that you are joining me on my art days! Hugs! I look forward to sharing another year with you Rebecca. Happiness & Health to you and yours! Thank you Cindy! Happy New Year – and on to new adventures on distant shores and around the corner. Hugs! Interesting and educational, as well. Masterpieces on cardboard! ! I enjoyed another masterpiece in this year’s paintings that was painted on cardboard. I am wondering if this “cardboard” was especially made for artists. When I think of cardboard, I visualize something very ordinary! and fragile! But, both of these paintings are certainly not ordinary, but very beautiful. Thank you for sharing! Happy New Year and welcome to another Calendar Year Adventure. I agree – cardboard seems very ordinary until an artist gives voice to its potential. Now you have me on another interesting research: Cardboard. According to Wikipedia, “The first commercial paperboard (not corrugated) box is sometimes credited to the firm M. Treverton & Son in England in 1817. Cardboard box packaging was made the same year in Germany. The Scottish-born Robert Gair invented the pre-cut cardboard or paperboard box in 1890”. No mention of artists, but the timing would be right for this painting. I continue to learn…. The 2019 Art Calendar is up today – always a conversation starter. The first painting was by Klimt Portrait Emilie Flöge https://commons.m.wikimedia.org/wiki/Gustav_Klimt. Paintings have many stories. Who’s was Emilie? How did Klimt meet her? Who designed the dress? Happy Happy New Year, Liz. Here’s to another year of amazing moments and discussions! Many hugs coming your way!